Don’t panic, Paul Pogba. Sure, you’re a destabilising present at Manchester United who criticised the team in public after a 1-1 draw with Wolverhampton Wanderers, in which you set up United’s goal and then were easily dispossessed in the build up to the equaliser. You could still be on your way to Barcelona. Although a word of caution: Barcelona’s board are not unanimous in their desire to recruit you, says ESPN. Some suits might think a huge fee of well over £100m for a over-hyped player who went “home” to United to finish the job and has succeeded in all but finishing Jose Mourinho, not worth the effort. And Mourinho had best leave, or else. The Sun hears Pogba say he will leave United in January if Jose Mourinho stays as manager. Did he really say that? 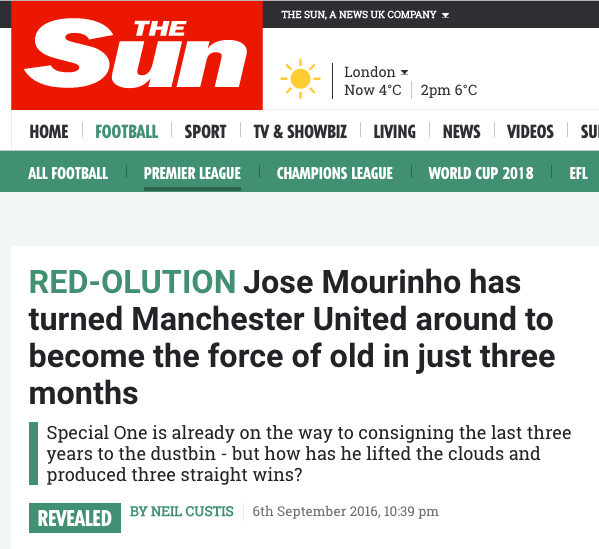 And how does the Sun know it – the Sun being the paper that has cheered longest and hardest for Mourinho at United?